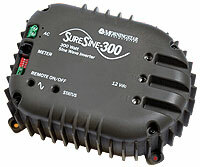 SureSine inverter has been developed using Morningstars power electronics expertise and 25 years of experience with remote off-grid photovoltaic (PV) systems. This product is a pure sine wave inverter designed specifically to meet the needs of rural PV electrification requiring AC power including solar home systems, schools, community centers and health clinics. This inverter is also a good choice for small PV systems for telecom, remote cabins and weekend homes, and RV/caravans and boats. The SureSines combination of performance, features and competitive price provides the best small inverter value on the market. It is highly reliable, having no internal cooling fan or other moving parts prone to failure.